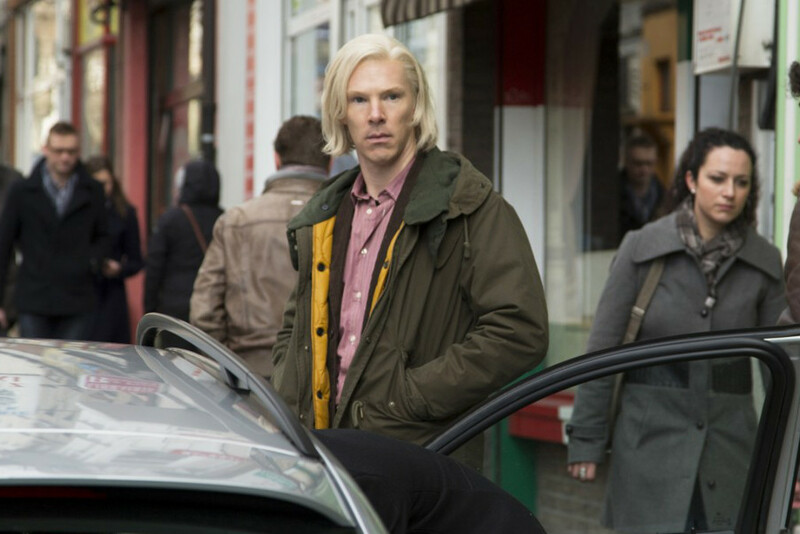 Benedict Cumberbatch does a splendidly accurate job in The Fifth Estate. Let's look at some other famous attempts. So, have you seen The Fifth Estate yet? Did you even know a movie called The Fifth Estate was out at the moment? Judging from last weekend’s box office results, you’re far from alone if you skipped it for Thor: The Dark World or Bad Grandpa. It’s hardly surprising given the film’s general crumminess. The film is based on the true story of Julian Assange and Wikileaks, but director Bill Condon adds so much garbled nonsense and visual frou frou that it becomes a great big mess. In an attempt to make the story of what is essentially a bunch of nerds typing a lot of HTML code into an exciting rollercoaster of thrills and danger, Condon falls back on repetitive visual tropes like text being reflected into a characters’ glasses, HTML code flying through the air, actors reciting the words they’re typing to one another, and — strangest of all — turning ‘the internet’ into an actual set. Apparently, the World Wide Web is little more than rows and rows of office furniture surrounded by dry ice! Still, if The Fifth Estate has one noteworthy element, it’s Cumberbatch’s accent. The man who’s played Sherlock Holmes, Khan and Smaug actually does a great job at capturing Assange’s wonky Aussie sound. Of course, Cumberbatch is hardly foreign to the world of celebrity impressions: his Chewbacca surprised Harrison Ford just last week, and he also does a good Alan Rickman, David Tennant and Jonathan Ross. Jane Campion’s outback-set Holy Smoke! is a ferocious piece of work and a powerful yet criminally underseen work of feminist fiction, but it’s greatest asset is the performance by Kate Winslet. Working under the guidance of esteemed vocal coach Victoria Mielewska, Winslet perfectly captured the sounds and inflections that populate Aussie dialogue, and never once sounds like she’s straining to get it right. A stranger would likely have no idea she was British. Labels such as “excellent”, “pitch perfect” and the “gold standard for Americans impersonating an Australian accent” aren’t exactly descriptions one would expect to find in a film as colossally misjudged and bizarre as Mental. Alas, Schreiber’s spot on accent was the only thing critics seemed able to agree on in regards to PJ Hogan’s spiritual sequel to Muriel’s Wedding (1994). It probably helps being married to an Australian (that’d be wife of eight years, Naomi Watts) and having worked opposite Hugh Jackman on Kate & Leopold (2001) and Wolverine (2009), but it’s still an uncanny effort. The most polarising accent of them all comes from Meryl Streep’s performance as Lindy “The dingo ate my baby!” Chamberlain. Streep, who has an undeniably canny ear for accents, wasn’t allowed the option of going subtle with the dialect given what she had to work with, but unlike Winslet, I imagine most Australians could see Streep working and spot the fake. It’s telling that the trailer for ‘Harry Potter’s Australian Excursion’ features barely any of its big star’s voice; that’s because Radcliffe spends the film desperately hoping audiences won’t notice it fluctuating wildly. It’s tough watching him try to keep it up with so many locals, but at least he didn’t go into full-on caricature mode like some actors. Speaking of caricature, RDJ found the Australian accent so funny he had to go their twice. Downey Jr’s appearance in Oliver Stone’s sadistic road trip, where he sounds like he jumped directly off the plane from ‘Steve Irwin’s School For Elocution’ is ridiculously over-the-top. Pacific is a big blockbuster about monsters and robots, partly set in Sydney, so it’s confusing why they didn’t just cast Australian actors as the Australian characters (ridiculously named ‘Hercules’ and ‘Chuck’). American Martini and Brit Kazinsky mangle their exaggerated accents; they’re an assault to the ears and had me openly guffawing at a packed opening weekend IMAX screening in NYC. Somehow, I was the only one laughing. Crikey! The Fifth Estate is now showing in cinemas nationally. Glenn Dunks is a freelance writer and film critic from Melbourne, and currently based in New York City. His work has been seen online (Onya Magazine, Quickflix), in print (The Big Issue, Metro Magazine, Intellect Books Ltd’s World Film Locations: Melbourne), as well as heard on Joy 94.9.